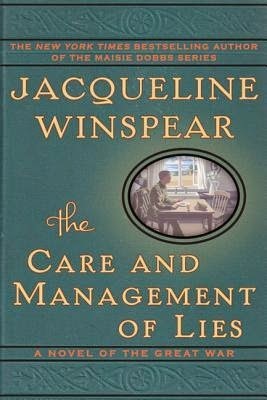 Jacqueline Winspear's first non-Maisie Dobbs novel is set in an earlier time period than that series: during World War I. At the heart of The Care and Management of Lies is the relationship between two women, Kezia and Thea, who have been close friends since they were young girls. Life has set them on divergent paths - Kezia marries Thea's brother, Tom, and settles into the domestic life of running a farm while Thea moves to the city and becomes deeply involved in the suffrage movement. And then the war comes. The war forces both Kezia and Thea to grow and change in ways they had not expected. When Tom signs up and is sent to France, Thea has to manage the farm on her own. Her letters to Tom are filled with delectable descriptions of fantastical meals to make his mouth water and assure him that all is well at home, though they are certainly facing deprivations. Kezia, an avowed pacifist and suffragette, determines to join up as well and serve in the medical corps rather than risk being charged with sedition or treason for her pacifist activism. As Kezia and Thea struggle with their new challenges, they feel keenly the distance between them, both physically and philosophically. Mismatched expectations and different desires for their lives have pulled them apart, but they are still drawn to each other by shared memories and their now familial bond. Each sees in the other a path her life could have taken, and their relationship is tinged with both grudging admiration and hints of regret. Kezia hated to see Thea so impassioned, so taken; it was as if she were in pain. She had seen it so many times over the years--Thea, always standing for something, whether it was small children who came to school without food in their bellies, of London's women of the night, many just girls, and most of them with little choice in how they could earn their keep Kezia wanted to bring Thea out of herself, to stop her fretting about things she couldn't change in the world. She wanted them to sit down together and share their confidences, as they had years ago. Kezia thought about Thea. Or, if she were to distinguish her thoughts with more accuracy, she considered how Thea was changing. It was as if Thea were becoming more defined, so that when Kezia saw her friend in her mind's eye, she saw her still, as in a photograph, only someone had taken a black pen and traced around her frame, outlining her, making her stand out. At then, limb by limb, button by button, and now the shoes, the ears, the hat, each part of Thea was becoming bolder and sharper. There was no part of Thea that might disappear...When Thea was acquiring more definition, she felt as if she, Kezia, were fading at the edges, drawing back into herself,..It was as if, when she looked at her body, she would see herself vanishing--disappearing. Had she ever been defined? I love the varied perspectives, the context in which Winspear places these characters to react to unfolding events. She points out, for example, that "Londoners and county folk" had different response to news of the war, that the poorer classes had "seen their share of death at home" as younger siblings died in infancy, mothers died in childbirth, friends died in accidents or illness. She allows her characters to grow and change as the war goes on, too. When a young German soldier, captured and sent to England for the duration of the war, is assigned to work on her farm, Thea and others in the country slowly warm to the idea that Germans - the enemy - are human, too. "I know I should hate him," one of the farmhands starts before commenting on the boy's loss - his brother had been killed in France - and relief at no longer being on the front lies. Their common humanity overcame the suspicion and hate prevalent in war. Beautifully written, achingly human, The Care and Management of Lies is a worthy novel of The Great War.